Before Twilight and True Blood, only one vampire commanded "the children of the night." 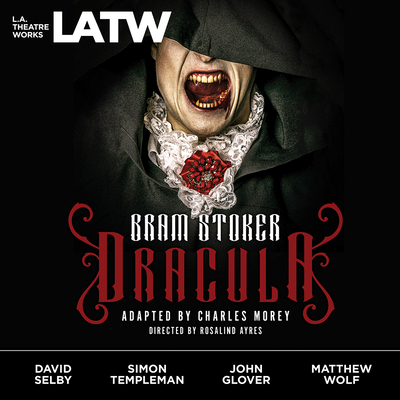 In this blood-thirsty tale of unholy terror, Count Dracula slips into Victorian London with a cargo of his native Transylvanian soil - so he can rest between victims. The city seems helpless against his frightful power, and only one man, Dr. Van Helsing, can stop the carnage. But to do this, he must uncover the vampire's lair and pierce his heart with a wooden stake. Program note from Rosalind Ayres, director of the live performance by L.A. Theatre Works: "For centuries man has dreamed of a life beyond death. Chinese Emperors were buried with clay armies to protect them in the next world. Egyptian Pharaohs were entombed with all the belongings they would need in the afterlife. But how might it be possible to cheat death itself? Well, try the myth of the Vampire. One who, by constantly drinking the 'life force, ' the blood of others, could ensure eternal survival.